Hardwood Flooring Care & Cleaning Tips in Orange CA; Call Leading Carpet Cleaning for Hardwood Floor Refinishing! Hardwood floors are fast becoming the number one option for home owners and their choice of flooring to install. Hardwood floors drastically transform the look of any home and provide a rich and inviting environment. They are durable, attractive and can last a long time if they are properly cared for. Just like other type of flooring, proper care is required to keep hardwood floors looking their best. Often time’s homeowners will neglect the care of their hardwood floors thinking that the floors are indestructible and will last forever on their own. This could not be farther from the truth. In many instances hardwood floors require more care and attention than tile, natural stone or carpet. The most important step to take when caring for your hardwood floors is to have them cleaned by a professional floor cleaning service at least twice a year. There are steps you can take on your own between these professional cleanings that will greatly assist in keeping your hardwood floors looking like new. It is important to vacuum your hardwood floor at least once a week. The fine grit in dust and dirt is just like sand paper and can do a serious number on the surface of your hardwood floor. Vacuuming is the best way to remove these tiny dust particles so they do not scratch up the surface of your floors. Be sure to set your vacuum to the bare floor setting to avoid further damage from the vacuum’s beater bar. There are some common household items that can dull and damage the surface of your hardwood floor. Hair spray and dusting spray are two of the biggest offenders. Both of these items will cloud the surface of your floor and prevent it from giving off that attractive shine. If you happen to accidentally get hair spray or furniture polish on your hardwood floor, make sure you wipe it up immediately with a damp cloth. One of the most damaging materials to your hardwood floor is water. Water cannot only ruin the finish on your hardwood flooring, but it also has the potential to penetrate deep into the wood and leave permanent stains behind. Do all you can to keep water from coming into contact with your hardwood floors. Contact Leading Carpet Cleaning today to have your hard wood floors professionally cleaned and left looking like new. 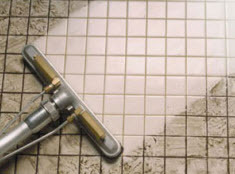 Should you Hire Professional Tile & Grout Cleaners in Fullerton CA? Yes! Call Leading Carpet Cleaning Today! When you walk through your house and notice that your tile floors are starting to look dingy and dirty, a standard broom and mop may not do the trick. The tile can be covered with a film of dirt that needs to be scrubbed off. In addition, the grout slowly builds up dirt that stains the color of the grout over time. Tile is a great choice of flooring that lasts long and can be cleaned easier than carpeting. Tile is usually made from a natural stone or a man made tile and is installed with grout. Grout is a cement that is filled in between the tiles and comes in several different colors. You can get the grout to match the color of the tile or you can go with a contrasting color. Whatever you have or choose, the tile will eventually need to be cleaned. Mopping is a great way to remove light surface dirt but in order to actually get the tile and grout deep cleaned, it takes a lot more work or a professional with the right equipment and experience. Leading Carpet Cleaning outlines why hiring a professional to clean your tile and grout can save you time and money! When you decide that you are going to get the grout cleaned and the tile, too you have to start somewhere. The tile can be done with a tile cleaner and a mop but the grout is an entirely different story. The grout will require you to get down on your hands and knees and painstakingly go bit by bit with a small bristle brush like a toothbrush. You will also need to get cleaner that is used for the grout specifically. AS you get started, you may quickly realize that it is going to take much more time then you thought. Even if you are doing the kitchen and entry way it will turn into a lot of work. If you hire a professional to do it they have specialized tools and techniques that will get the grout cleaned and looking great. They can also follow it up with a sealant on the grout to help prevent the stains from setting in. If you decide you are going to get the grout cleaned, you are most likely going to have to go to the store to buy the items that you need to do the job yourself. This can turn into trial and error shopping. You want to get the correct cleaner and tool so that you don’t cause any damage to the tile or grout lines. If you don’t clean it correctly you could cause damage and that in turn will need to be fixed. A professional that specializes in grout repair will need to come out and repair the areas that have been damaged. If you hire a professional you can rest assured that they have the experience to complete the job with no damage. If by the off chance there is damage, they are insured and can have it repaired for you. Call Leading Carpet Cleaning today if you want to save time and money getting your tile and grout cleaned in Orange, Santa Ana, Rancho Cucamonga, Anaheim, Whittier, Riverside, Chino & Fullerton California. Is Vacuuming Making Your Allergies Worse in Chino CA? Call Leading Carpet Cleaning for a Deep Steam Clean that Removes Allergens! 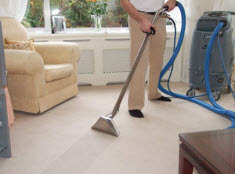 The best way to keep your carpets clean in between your regular professional carpet cleaning is to run your vacuum on a regular basis which should be daily depending on the amount of traffic that comes through your house. The vacuum is an appliance that all homes across America has and uses suction to pick up the dirt, dust and debris that is brought in and on the carpet. All the dirt and debris makes its way in the house on peoples shoes or pets paws that come through the door. Depending on the amount of people or pets you have in and out of your house will depend on the amount of vacuuming you might need. Even if you don’t have a lot of traffic you still have debris that is circulating in the air that can be landing on the carpets. Vacuuming is the best way to get rid of it, but can it be making you sick in your own home? Leading Carpet Cleaning explains how vacuuming can make you sick and what you can do to prevent it. When you use a vacuum, you are stirring up the dust, dirt, debris and bacteria in the carpet and sending it in the bag or canister depending on the kind of vacuum you have. The air that is being sucked up also has bacteria in at like the kind that causes the flu. The way that most people assume this is being taken care of is through a filter. The filter is supposed to stop the majority of the dust and bacteria from spreading around the home. The problem is that most people overlook the cleaning of the actual vacuum and the filters. When the air is dirty and bacteria filled, it can cause the viruses and bacteria to spread among the family. It can also send dust into the air that can cause people who suffer from allergies and asthma to have flare ups and breathing difficulties. Make sure you clean the bag out and replace it with a new one or clean out the canister. You also want to be sure that the filters are cleaned with water and left out to dry all the way before you use the vacuum again. This is to ensure that the dust does not get thick and block the filter. You should also be sure to have your carpets cleaned by a professional to get a good deep clean to the carpets that is beneficial in removing the excess dirt debris and bacteria. If you are ready to get your carpets nice and clean by professional carpet cleaners, call Leading Carpet Cleaning today in Orange, Santa Ana, Rancho Cucamonga, Anaheim, Whittier, Riverside, Chino & Fullerton California to make an appointment. With the holiday season behind us, it is time to get the house back in order and get back to the day to day routine. Over the holiday period, you may have had parties where your favorite alcoholic beverages where served. Perhaps only now you have realized the various stains among your carpet and upholstery. Or perhaps in celebrating another holiday rush over, you spilled a fresh glass. Leading Carpet Cleaning would like to share with you some tips on removing alcohol stains from carpet and upholstery. 1. On a fresh spill, blot up as much of the liquid as you can with a paper towel. If it is dried out, lightly dampen the stain with cool water. 2. In a clean bucket, mix 1 Tbsp of liquid dish soap, 1 Tbsp white vinegar and 2 cups of warm water. 3. Using a clean white cloth, sponge the mixture onto the stain, being careful not to over saturate the stain. Blot frequently until stain dissolves. If needed, use a clean, white, dry cloth to control the liquid distribution. 4. Rinse with cool water with another clean cloth and sponge on while blotting. If stain persists, try 1 part white vinegar and 2 parts hydrogen peroxide, and follow steps 3-5. 1. Blot as much liquid as possible with a paper towel. 2. Mix 1 Tbsp liquid dish soap and 2 cups cold water. 3. Sponge the solution onto the stain carefully, and blot as you go until stain is dissolved. If upholstery requires dry cleaning, apply your dry cleaning solvent according to the manufacturer’s directions. 1. Blot as much of the liquid out as you can using either white paper towels or rags. 2. Mix together 1 Tbsp dish liquid soap and 2 cups warm water, and sponge it on the affected area. Carefully blot. Don’t rub or scrub. 3. With a cloth dampened with clear water and rinse the soapy area. 4. In a spray bottle combine 1 Cup white vinegar and 2 Cups warm water. Make sure to mix thoroughly and apply the new solution to the blemish. With a dampened cloth from clear, cold water, blot the stain. Continue to absorb the liquids while blotting until dissolved. 5. Towel dry area, and allow remaining dampness to air dry. 6. 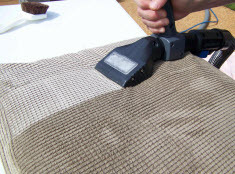 Once the area is completely dry, vacuum to relax the fibers to their original state. NOTE: Whether you use a commercial product, or a home remedy, always conduct a patch test in an inconspicuous area to ensure the cleanser will not compromise the integrity or color of your carpet fibers or upholstery. For stubborn stains, or for a deep cleaning, hire Leading Carpet Cleaning for the job. Our quality trained experts have state of the art equipment and top of the line detergents geared for removing most stains, and giving your carpets a deep, fresh clean. Call us today for your next appointment!